Imagine Joni Mitchell, age 9, smoking cigarettes and listening to Claude Debussy records at her Saskatchewan home. Though this prairie girl was pigeonholed into the realm of folk as she was just coming up in the late '60s, her first interests were rooted in classical music. 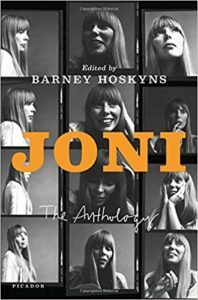 Joni: The Anthology offers a chronological account of the unprecedented musical endeavors she took through rock, jazz, pop and beyond, as well as a copious helping of her love of painting. A collection of reviews and interviews - inaccessible or otherwise difficult to find, even in the age of the Internet, from a plethora of sources including MOJO, Rolling Stone, and Melody Maker cascade through the decades to paint a portrait of Mitchell that is as complex as it is revealing. Interesting are the juxtapositions: on one page a music critic denounces her experimentation with jazz, while on the next Mitchell explains how her original chords were so distinct that rock musicians couldn't grasp them, so she was suggested to hire jazz musicians on her later albums. Mitchell goes on to explain that her music went "outside the laws of jazz," creating totally original music that the taste-spinners pushed aside. Those harmonics are currently being studied and taught in music schools. Joni: The Anthology invites you to sit in on a photoshoot as Mitchell, dressed in all black, mourns the loss of Bluebird, her stolen Mercedes Benz, which she bought with her first royalty check in 1969; learn why she snubbed the Rock and Roll Hall of Fame's invitation for her own induction, or why she chose to not play her hits on that 1998 tour with Bob Dylan and Van Morrison; understand just why her most appreciated compliment from a blind black piano player was that her music was raceless and genderless - a corroboration to why American jazz pianist Charles Mingus invited Mitchell to pen words to his chops on Mingus. Readers are privy to more personal matters like how she couldn't fulfill Graham Nash's desire of a traditional wife, or the relationship she developed later in her life with Kilauren, the baby girl she gave up for adoption when was 21. Aside from her discography and personal life, Anthology succeeds at presenting a didactic voice through the changing times. Her concerns in ecology and preservation are topics of concern equally important to Neil Young and Willie Nelson. Music mogul David Geffen once told Mitchell, "You're the only star I ever met that wanted to be ordinary." Whether because of this, or in spite of this, we've placed Joni Mitchell among the constellations. There's a reason why my mother loves her, why Hissing of Summer Lawns was Prince's favorite album, why Bill and Hillary Clinton named their daughter after her song "Chelsea Morning," and why the second-in-command of the LA Crips - a three-hundred pound black man - is a fan Joni Mitchell. This article has been viewed 1,324 times since being added on October 12, 2017.